Both Lost and 24 ended their runs this week. Where do I go to now for implausible, illogical story twists and senseless violence? Just Smile and Change the Subject. That is my advice to single girls over 30 years of age that are attending family weddings. Especially if you're Asian (from my own experience and that of my friends). Don't make the mistake of trying to justify your singledom; just move the conversation along! The worst thing you can do is let the topic linger until more and more of your aunts and uncles join in and add their own commentary. Then the conversation will never end! If you're at an Asian wedding, then you're probably in luck because chances are, you're at a giant banquet. And what do we know about Asians, especially people around our parents' age? They love talking about FOOD. [Any relative]: "So, [insert your name here], when is it going to be your turn?" You (smiling): "Well, uh...Oh, look! 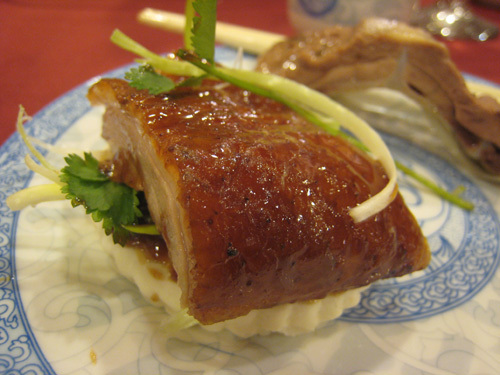 How 'bout that Peking duck?" For all that you have to put up with, you should at least get some good grub out of it. Puck: "I feel like that guy who lost all his hair and then all his strength." Or is it the other way around? Well, on a recent Saturday, it did seem like the other way around. 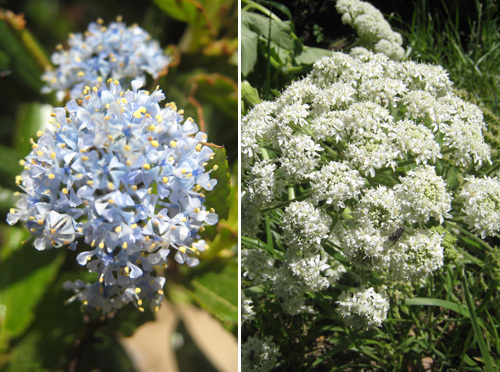 After a long stretch of rainy, overcast days, we finally got a beautiful sunny day in the Bay Area. 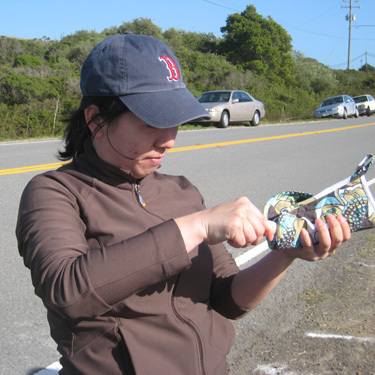 YJ drove Megs, Lan, and me to Point Reyes National Seashore for some hiking and Tomales Bay oysters. 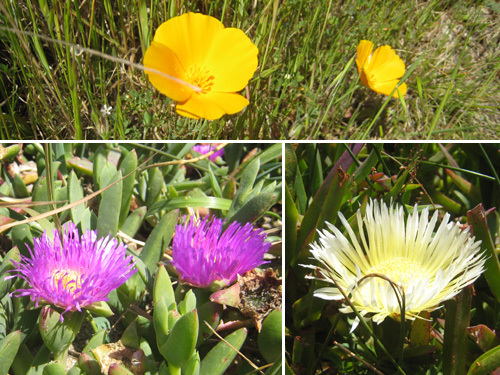 We chose a relatively flat, five-mile hike (300 ft in elevation) called the Coast Trail - Laguna Loop. 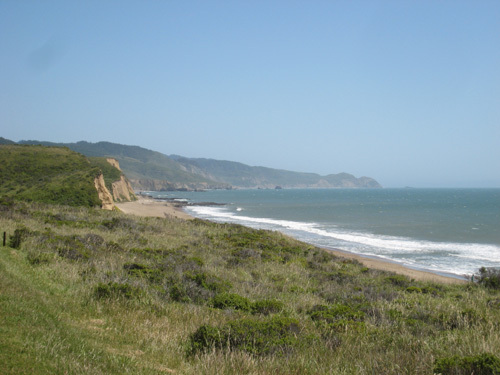 As the name suggests, the trail takes you to the coast, and you can access the beach via a small path off of the trail. There were wooded areas at the beginning and end of the loop, but the coast areas were mostly just grass. According to their hiking guide, technically there is a "riparian zone," which I looked up because I don't know what it means (it means near the banks of a stream), in addition to coastal scrub and grassland. Even though Megs was recovering from an injured ankle, she still booked it and was way ahead of the rest of us. Thanks for making me feel lame, Megs. Anyway, we took a snack break at the beach and started heading back to the trailhead. At one point, a bunch of big birds appeared. At first I couldn't figure out what they were, but I could make out their big beaks. I thought maybe they were pelicans, but I wasn't sure because the word brings to my mind a cartoonish version of a bird with a bunch of fish in its beak pouch thing. 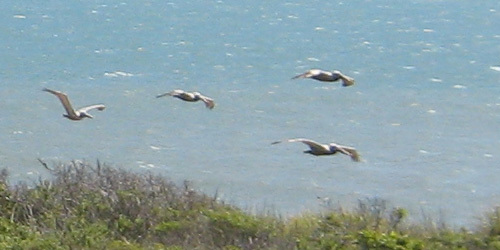 But after looking at a picture of them at one of the signs near the trail, I concluded that they were, indeed pelicans. So we kept walking. And walking. And walking. And at one point, I was thinking that maybe we had missed a turn. It just so happened that we bumped into a fellow hiker, who told us we had missed our turn. He said we could either double-back and finish the trail as planned, or we could turn at a different spot and take a different path back that had "the best views" and had an elevation of 1,000 ft. I told him that one person in our party had a recovering injury, so we would probably take our original route. But to be honest, my non-injured self wasn't really feeling walking 1,000 ft up. He shrugged and said, possibly with a hint of disdain for our non-athletic ways, "You'll have fun either way." Out loud, I said, "Thanks," but I actually was thinking, "I really think I'll have way more fun on the flat path versus the giant hill." So we doubled back and ended up walking maybe 6 miles instead of 5 miles. The way back to the car was not without its moments. There was a point in the ascent where my mind went into the "I don't think I can climb any more but I refuse to be this lame" zone, and then at another point we had to traverse this extremely muddy patch. I ended up sinking in the mud and getting it all over my pants and shoes. Good times. We rushed back to the car and started driving very quickly because we were afraid we wouldn't make it to any of the Tomales Bay oyster places, which close pretty early. 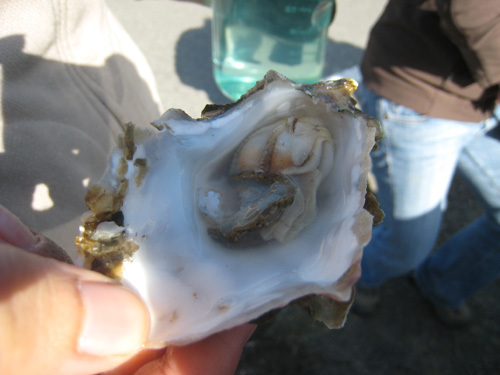 Hog Island Oyster Company was closed, so we high-tailed it to Tomales Bay Oyster Company. We got there just in time with less than an hour before closing. Even though we had discussed in the car that we should not buy too many oysters, we still ended up buying the bag of 50 --- that's right, FIVE-OH --- because the per unit savings was too much for our Asian selves to resist. We got back to the car, opened the mini-cooler, and encountered a problem. 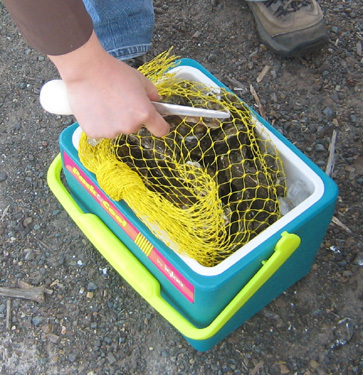 My mini-cooler couldn't accommodate all 50 oysters. What to do? Eat the overflow until we can close the damn cooler. So Megs (the expert shucker) and YJ start shucking, and all four of us, standing by the trunk of YJ's car parked alongside the road, start slurping away. Not the most sophisticated ambiance, but you gotta do what you gotta do. After we'd eaten enough so that the bag fit in the cooler, we drove back through Point Reyes and made a snack stop, and then headed back to my pad. I made a quick salad with a balsamic vinaigrette plus some mignonette sauce, Megs washed my dishes to make room for shucking, and Lan and YJ got some more grub at Trader Joe's and Zachary's Pizza. After a lot of shucking and prep, we sat down to dinner: raw oysters on the half shell, Zachary's chicken pizza, a simple salad, plus soda and beer. It was a wonderful meal. What could be better than good food and good friends? Man, I love that show. Phil Dunphy is awesome. "Every realtor is just a ninja in a blazer. The average burglar breaks in and leaves clues everywhere, but not me. I'm completely clueless."